The Overseas Filipino Workers (OFW) will solely benefit the funds intended for them from the Overseas Workers Welfare Administration (OWWA). This will be the first time in four decades that national government will give funds solely for OFWs program and services. This is based on Republic Act 10801 or the Overseas Workers Welfare Administration Act of 2016 that declaring the agency as a national government agency and an attached agency of Department of Labor and Employment (DOLE). 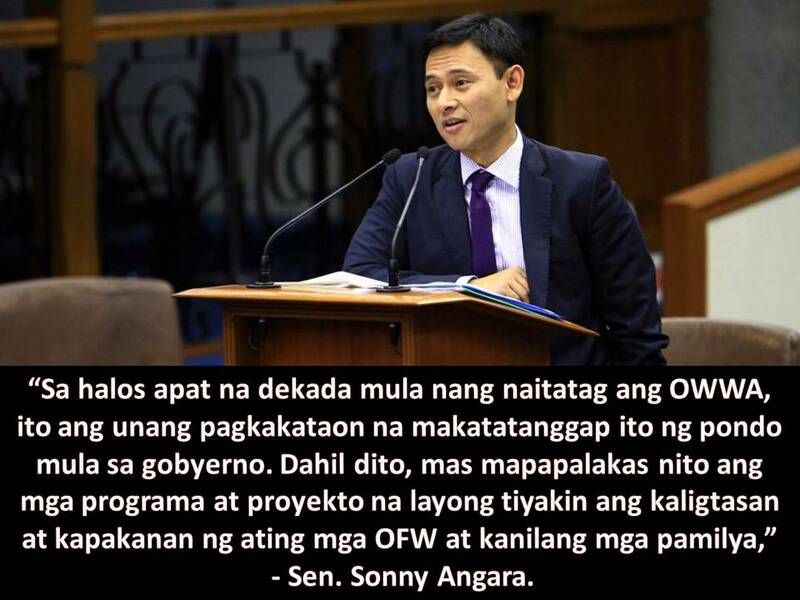 Senator Angara is the author of OWWA Act 2016. 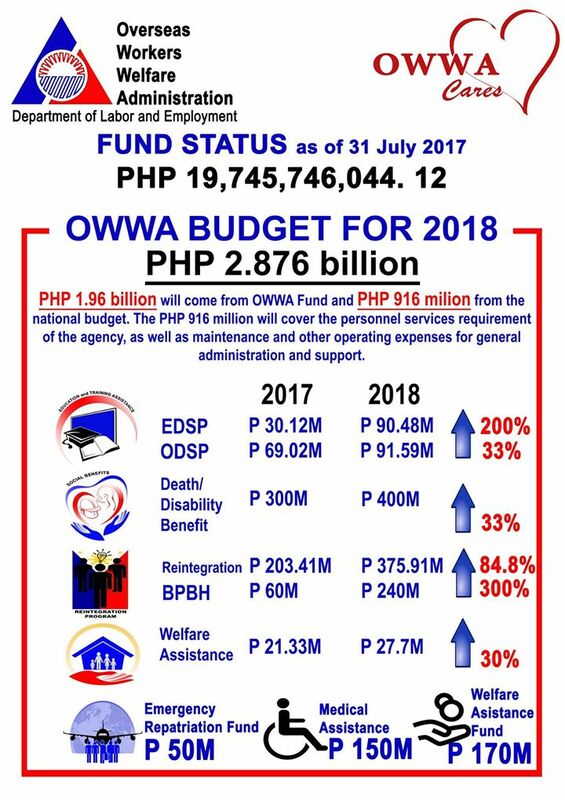 For 2018, the OWWA alone has a total budget of P2.879 billion. P1.96 billion of this is from OWWA fund and P916 million is from the national budget. The P916 million will be used as personnel services requirements and maintenance and other operating expenses for general administration while the P50 million is allocated for emergency repatriation program. The OWWA fund will be used in program, services and for the welfare of OFWs and their families such as insurance coverage, legal, placement at remittance assistance, social benefits, educational assistance for OFW dependents, repatriation and reintegration program. 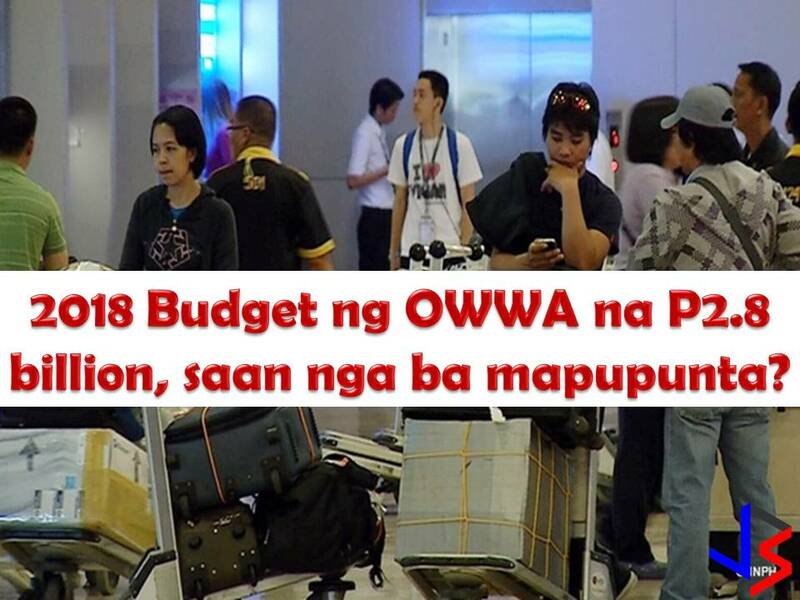 Where will the OWWA's P2.8 billion budget go next year?